When you want to shift to a place of peaceful balance, take 3 deep breaths, then give Boost a spray up and away, allowing good vibes to rain your way. Spray it before going into a meeting, or after a challenging conversation. It’s great for enhancing your meditation or yoga practice, but may be used anytime to bring you into a state that’s calm and centered. 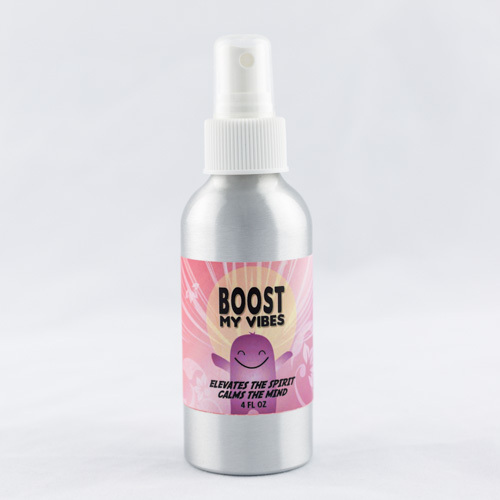 This spray can be used anywhere because the light scent of pure essential oils dissipates in a minute, leaving only good vibes behind. All ingredients are of the highest quality and have been chosen specifically for their ability to elevate the spirit and calm your mind. Omani Frankincense Essential Oil – elevates your spirit, aligning with your higher self. California Solar Sea Salt – sun-drenched joy juice for your heart chakra. Rose Pyramidal Salt – connects you to ancient wisdom and expanded consciousness. Neroli – Brings you into wholeness, lifts your sorrows and lets the spirit soar. St. Johns Wort – brightens your day and takes your blues away. Shui Xian (Water Sprite) Tea – raises your vibration and helps you to go with the flow. Ships from Portland, Oregon via USPS Priority Mail (3-5 business days) 4 oz Bottle = $21.95 + shipping costs. Do you live in the Pacific Northwest?